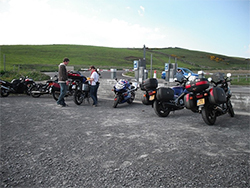 MAG Ireland report that the Cliffs of Moher Visitor Center situated on the West Coast of Ireland – County Clare has gone biker friendly. 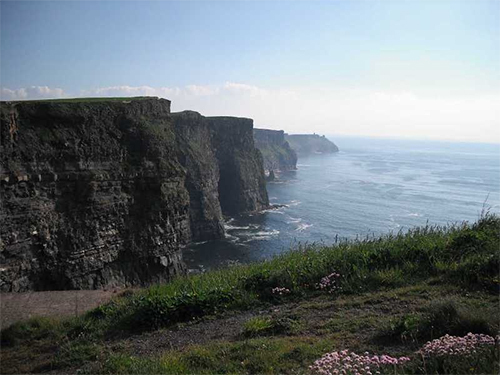 This Summer, a MAG member who works for the Cliffs of Moher Visitor Center managed to arrange separate bike parking at the Cliffs of Moher along with the facility to leave your helmet/tankbag etc. in the hut at the car park while you visit. He then went on to arrange a discount for MAG members. So we in the executive ever mindful of looking after members interests (and fancying a decent spin) went along to see what was on offer. 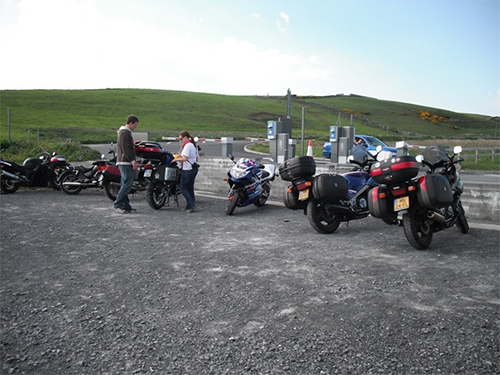 On arrival at the cliffs, we were met by Mickey (a MAG Member) and shown to the bike parking area adjacent to the barriers, which is segregated from the car park itself (see pic) so no fear of cars knocking over your bike. 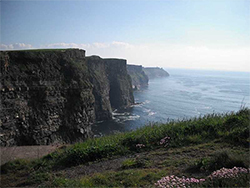 We left our helmets and jackets in the car park hut, and Mickey took us over to see the visitor centre and the Cliffs. The visitor centre itself is only recently completed (having opened in 2007) & houses exhibits on the history & geology of the area. In the auditorium there’s an excellent film of the wildlife in and around the Cliffs – watch out for the crow at the start when you see the film. The visitor centre also displays local artist’s offerings including models made by our own Mickey. Having completed our tour of the visitor center, we then went outside and looked around the Cliffs, and very impressive they are too. 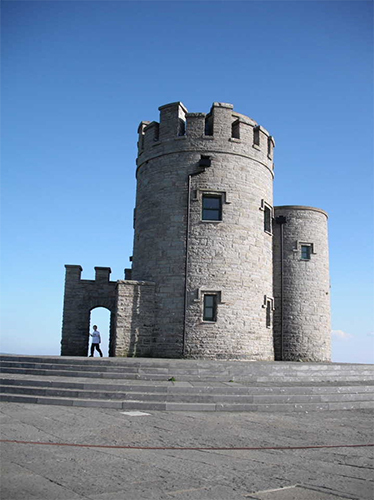 There is a folly on site called Ó’Briens Tower with amazing views of the Cliffs and the Aran Islands on a clear day. Well worth a visit and the climb up the stairs as you can get some stunning panoramic photos from the top. Having had a leisurely look around, we were sitting down having a chat to Mickey when suddenly there was a loud crash! “Uh-oh” said Mickey, “ there goes a bit more of the cliffs!”. Apparently this was the reason that the Cliffs were fenced off. It’s simply too dangerous to stand at the edge as you never know when part of the ledge might break away. Mickey illustrated this point by reminding us of a photograph we’d seen in the exhibition of a family picnicking near the edge, and then pointing out the sheer cliff where once that ledge had been, now long since claimed by the sea. Our thanks to Mickey for organising the dedicated motorcycle parking and MAG discount. If you are organising a charity run or bringing a bike tour to the cliffs, please get in touch with the office, and we’ll pass on Mickey’s number.